Are your RAV4 door locks not working? Is just one broken? Does your key fob no longer unlock the doors? Here is a handy guide to help diagnose and fix the problem. Having a problem with your door locks? Here is how to fix them. Power door locks are a great feature for any vehicle except when they don’t work properly. Then, they are a nuisance. Before you begin this project, you will need to determine exactly what the problem is with the locks. Take a few minutes and test all the door locks, key fob and the manual lock for each door. Once, you have narrowed down the problem, find the section that covers your problem. If you have multiple doors or if all the doors don’t lock/unlock with the key fob or manually, you either have an electrical issues or a blown fuse. First, check the fuse by looking at your owner’s manual to determine where the fuse box is and what fuse relates to it. Then, replace the fuse. If that didn’t solve your problem, then it could either be a bad battery in a key fob (see section below) or a bad electrical relay. We don’t recommend tackling the electrical relay repair on your own since it could be something simple or something really complex. For this repair, we recommend bringing it into your local Toyota dealer. Find a replacement part by visiting parts.olathetoyota.com. First, disconnect the negative power supply on the battery. Since we are going to be working on an electrical component, we need to make sure the power is off. Remove the door panel by locating screws how the plastic on the metal door. These screws are commonly found on the arm rest, behind the speaker and along the door panel itself. Once you have removed all the screws, carefully pull the plastic panel away from the door. You will hear plastic clips popping lose. Be careful to not force the door and snap the plastic clips. As you remove the door, you will see an electrical cord connecting the power door locks to the inside electrical clip. Carefully, unhook this connection. With the door fully removed, you should see a plastic shroud protecting the inner door components. Carefully, peel back this shroud. Next, locate the locking mechanism which is usually done by following the locking long rod. This rod connects to the manual lock on the top of the door panel. At the bottom of this rod, is where your actuator is normally found. Replace the old actuator with the new one by removing the screws holding the old one in place and adding the new one using the same screws. If you have the right actuator, everything should line up correctly. 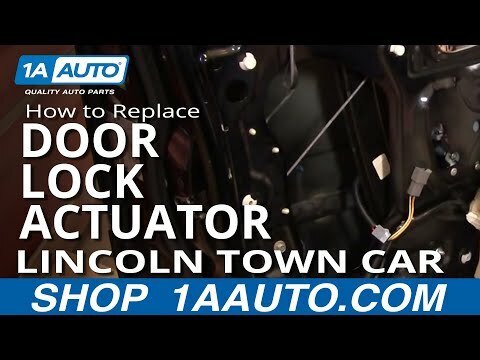 Then, replace the door panel and remember to reconnect the power door lock electrical connection. Lastly, tighten down all screws and test the power door lock. If you followed the steps correctly, you should have a new door actuator in place. If your key fob doesn’t work, yet the manual door lock button does, it is time for a new key fob battery. This battery is located inside the key fob and can be accessed by opening the fob. In order to open it, you will squeeze on the sides of the fob to pop open the front and back. Once you have it opened, locate the battery and replace it. This should fix the problem. Hopefully, one of these solutions fixed your problem. Having additional questions? Ask us below.